The construction industry has become THE major focus for the drone industry in 2017. 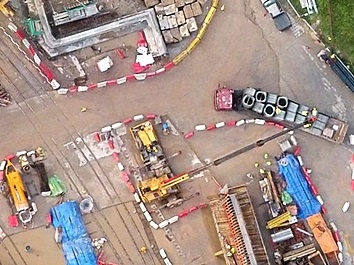 In this article I want to explore the possibilities that drone data presents to construction site teams and project managers as well as the strategic alliances now in place in the industry. The points raised here are expected to shape the industry in years to come. According to a much cited report by PWC published in May 2016 titled “Clarity from Above – PwC global report on the commercial applications of drone technology” drone powered solutions could be involved in construction & infrastructure services valued at $45 billion in 2016. This is the potential market that drones represent in construction and infrastructure (e.g. Road Management) according to PWC. And according to a Report by Goldman Sachs, published in March 2016, construction will be the largest use case for commercial drones in the near future, generating $11.2 billion of the projected $100 billion in global spending in Drone Hardware over the next five years. Meanwhile, the global construction industry is expected to surpass $10 trillion by 2020, according to data provided by the Construction Intelligence Center. However, despite huge sales it operates with low average margins of less than 1%. Furthermore 80% of projects are typically seeing large cost overruns and an average of 20 month delays. Drone and Geospatial data is expected to help improve on those efficiency and productivity metrics by integrating project management systems with technical drawings & BIM data (aka maps) and aerial photos at various spectral bands (visual, infrared, …). What does this mean? Drone Maps, Blueprints (e.g. AutoCad), Inspection Reports (Site Memos, Non-Compliance-Reports, etc…) will all be integrated into one simple-to-use solution, available on both mobile and web platforms. This is what we have been working on for the past 2 years here at MapGage.com. 3 years ago nobody would have thought that a DJI Phantom drone would become a perfectly suitable tool to monitor a multi-million dollar project. With the introduction of the improved Phantom 4 PRO camera system, DJI has effectively thrown an SLR-quality capable drone system onto the market at the price of a lower-range SLR (the drone is just a bonus!). This makes every more expensive drone that carries an SLR basically obsolete unless it can compete on other metrics (more about that in a later blog). Most use cases on a construction site rely on RGB (visual spectrum) range imagery and would cover less than 2 square km or 25km length (e.g. road construction). At less than 1900 US$ for a set with a dedicated remote control the DJI Phantom 4 Pro is the perfect cost-effective drone for these scenarios and cheap enough to be expandable. This low-cost entry to using drones will leave no excuses to project owners and project managers to ignore drones on their sites in 2017. A perfect example of democratizing technology by lowering the price point. Just look at the following video review from Colin Smith from PhotoshopCAFE to understand how much better the P4 PRO camera is compared to other sub 3000 US$ drones out there. At MapGage.com we started flying drones many years ago and tried to sell our clients Drone images, later Drone maps as a perfectly suitable tool to gain project insights . But Drone images can only reveal the outside of a construction project. This might be useful particularly during the early phases of a project for excavation, topography and other “superficial” inspection tasks, but once the construction is underway a lot of action takes place inside the partially built structure. It became clear that combining Blueprints and Drone Maps as well as inspection report data would give project managers a much better tool to understand how well a project is advancing or where delays could be expected.Centralizing all of these inputs to the management process is critical for making better decisions based on job site situational awareness. This is what we at MapGage have been tirelessly developing in recent years. MapGage is not alone at understanding this crucial development. Chris Anderson first helped raise 100M US$ for 3D Robotics just to fail against DJI and then realize that flying drones does not solve any of his client’s issues. What happens to the collected drone data and how it is used is what creates real value. So 3D Robotics focused on construction clients and started to develop a software solution with a vision to integrate it with CAD and BIM solutions. With this strategic pivot 3D Robotics recently raised another 53M Series D (bear in mind Series A-C lead to a total failure) and is currently working on a new product with which project teams can compare as-designed and as-built versions with a simple drone flight. Again, Drone Maps and Drone Data just yield information but do not solve any operational issues unless they are integrated into a company’s operational processes. With image resolution at 200 feet providing cm-per-pixel definition, drone-mounted cameras give earth-movers an unprecedented look at grading efficiency and dirt-in-motion. Earth-moving is a major market for UAV software services in the construction sector, which is our largest business vertical overall. Some drone operators recognise this and like Pittsburgh-based Identified Technologies focus their offering almost exclusively on graders, excavators and earth-moving contractors. Topography and materials imagery is poised to extend beyond earth-moving. When combined with scanning sensors and laser measurement tools, they could disrupt the building material supply chain by providing real-time data on inventory and materials. Just by flying a UAV across a site, we will be able to get a quick look at material stocks! What might seem a potential hindrance is actually a blessing: Better Regulation when it comes to flying commercial UAVs. In the United States the missing regulation was a hindrance making it difficult to fly commercial drones, while other countries such as France and Poland especially were very open to the commercial use of Drones at a very early stage. After a lot of back-and-forth during 2015 and early 2016 the FAA’s final rule for small, unmanned aircraft went into effect on August 29, 2016. It provides specific safety regulations for non-recreational use of unmanned aircraft weighing less than 55 pounds. That means UAS users who want to fly for commercial use (such as providing aerial surveying or photography services on a construction site) or fly incidental to a business (such as performing roof inspections or real estate photography) must follow these regulations. The rules are evolving and will become simpler and more straightforward in 2017. 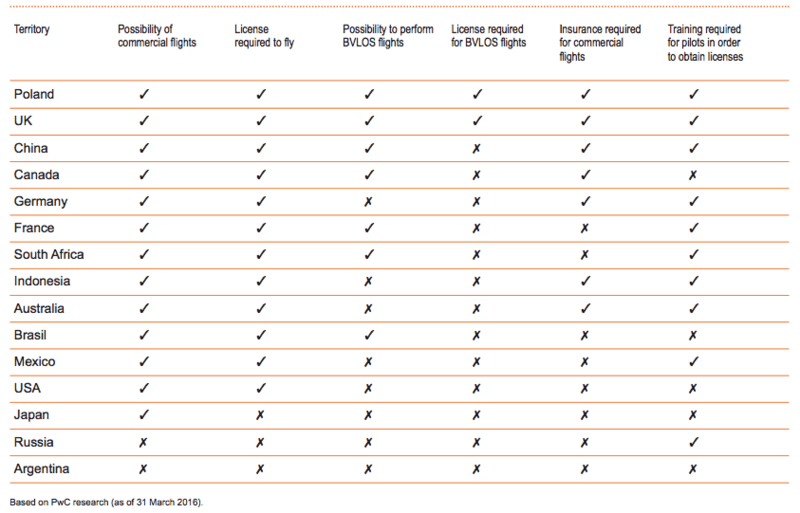 Registration is mostly done online and training of pilots is now clearly defined. A business will have no excuse to not comply with regulations and will know exactly what to do if it wants to start using UAVs on its sites. This will also lead to a decline in drone insurance already a commodity being now extremely affordable. Construction sites are low risk areas as there are already numerous safety regulations in place and a small drone weighing under 2Kg only marginally increases potential risks on a site. The FAA’s commercial drone regulations notwithstanding, drone makers and software providers are quickly moving to optimized pre-flight planning & programming, data capture and analysis that can be achieved with the single touch of an app button. 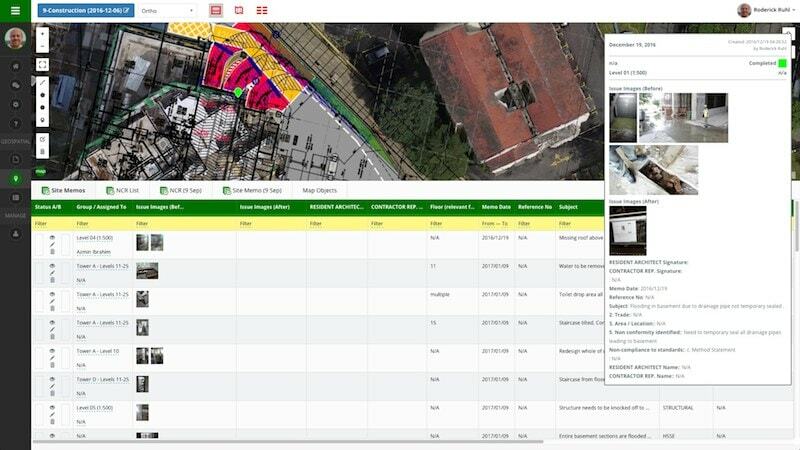 Numerous Apps let users define scan areas by drawing a polygon on an aerial view of the job site, define a flight height, required overlap and the drone will do the rest. A lot of our construction clients had originally intended to manage their drone fleet and manage pre-flight-planning and post-flight-data-analytics in-house but quickly found the processes to be resource intensive. Simple web based solutions are now taking over and could potentially mean big business as recent acquisitions have shown. On the left side (Step 1) are the simpler steps that are needed to manage a drone fleet, request a flight, get the required approvals and deploy a pilot with a drone. It might seem a simple task but optimizing this step is important enough that Skyward, a drone management software company, was recently acquired by Verizon for an undisclosed amount. Next are all the companies that help a construction company to process drone images into Maps and 3D Models. Pix4D, DroneDeploy and others are important players in this field. ArcGIS for example completely missed out on this map processing step and now has to rely on Pix4Ds technology to provide a streamlined solution within its software suite to process drone maps. At MapGage we are able to process drone images but we rather allow clients to import drone maps from Pix4D and DroneDeploy with a simple press if a button. We want to focus on operational value. For every step in the commercial drone process there are solutions available making each step easy to implement. These push-button solutions for UAV flights are meant to eliminate the need for a drone specialist on site to manage flight operations and provide business intelligence from drone data analysis. Many people are not aware how the interconnection of web services has accelerated their use in recent years. A company can sell its products online and integrate their online sales with their web based warehouse systems and web based accounting systems. All from different vendors. No more expensive systems integrations. Just a simple API call and data moves from one system to another. We will start seeing this more and more in web based UAV solutions throughout 2017 as many smaller web based UAV solutions will emerge solving a small step in the commercial UAV industry process described above. They will rely on open source formats developed by geospatial industries around the world in previous years such as KML, GDAL, Leaflet, MBTiles, GeoTIFF, CSV. This allows data to move freely from one system to another. Many companies will also realize that they need to be open if they cover only a portion of the commercial UAV industry process. On the other hand companies like Kespry are trying to cover everything, keeping their solution as closed as possible, thereby risking to be left behind by many smaller more flexible players that offer interconnected solutions. Recently there has been lots of merger and acquisition activity in the UAV industry. This is linked to the emergence of a clearer picture of the future commercial UAV market and the way it will evolve both in software and hardware. Also, the use of Drone data and how it replaces or improves operational segments has huge implication for current market leaders in specific industry segments. If they do not act now it might turn out to be an expensive mistake in the future. We will cover this in a future blog post. Stay tuned ….